Trump Says Sanders' Health Care Plan Would Visit 'Curse' Upon U.S. In a move likely to elevate advocates of single-payer health care, President Donald Trump vowed to veto the legislation Thursday. 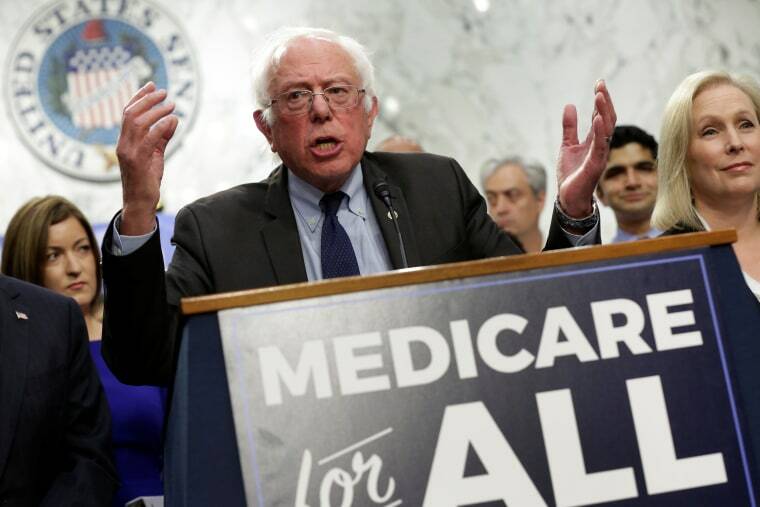 WASHINGTON — In a move likely to raise the profile of a Democratic plan for single-payer health care, President Donald Trump picked a fight with Sen. Bernie Sanders on Thursday, calling his legislation for expanded coverage a "curse." Trump said single-payer health care — which would replace private health insurance with a government-run program — would be "a terrible thing for our country" and in a tweet called it a "curse on the U.S. & its people." The president blamed Republicans for allowing the idea to gain traction among Democrats because the GOP failed to repeal the Affordable Care Act. "We got very poorly treated on the health care plan, and now you see what's happening where people are going single-payer — exactly what I said would happen," Trump told reporters aboard Air Force One as he headed to Florida to tour the damage from Hurricane Irma. "So the Republicans have to stick together better." In a tweet, the president added that he would veto the legislation, "because I love our country & its people." Sanders hit back at Trump quickly, tweeting, "No Mr. President, providing health care to every man, woman and child as a right is not a curse..."
Single-payer health care, which Democrats refused to even consider less than a decade ago as part of the Affordable Care Act debate, has gained momentum at stunning speed recently inside the Democratic Party. On Wednesday, 16 Senate Democrats — including many of the party's strongest potential presidential candidates — signed on to Sanders' bill to transition to a Medicare for All system. A majority of Democrats in the House are backing a similar bill. But single-payer health care still stands virtually no chance of passing, let alone even being considered, as long as Republicans control Congress. More likely, Trump’s veto threat is aimed at raising the profile of Sanders and his movement to use them against more moderate Democrats, especially those who running for re-election in states Trump won next year. Advocates are convinced that single-payer is both good politics and good policy, and some have called it a "litmus test" for Democrats considering running for president in 2020, but have steered clear of making similar demands of 2018 candidates. Republicans look poised to make the issue part of their strategy this year. Sen. John Barrasso, R-Wyo., on Thursday asked the nonpartisan Congressional Budget Office to review Sanders’ legislation, expecting it to come in with an eye-popping estimated price tag. Sanders, as ranking member on the Budget Committee, could have requested a CBO score himself but did not. "Senate Democrats’ plan is the worst of all worlds: government-run health care, the largest tax hike on American families in history, and a massive increase to our national debt," said Katie Martin, a spokeswoman for the National Republican Senatorial Committee.